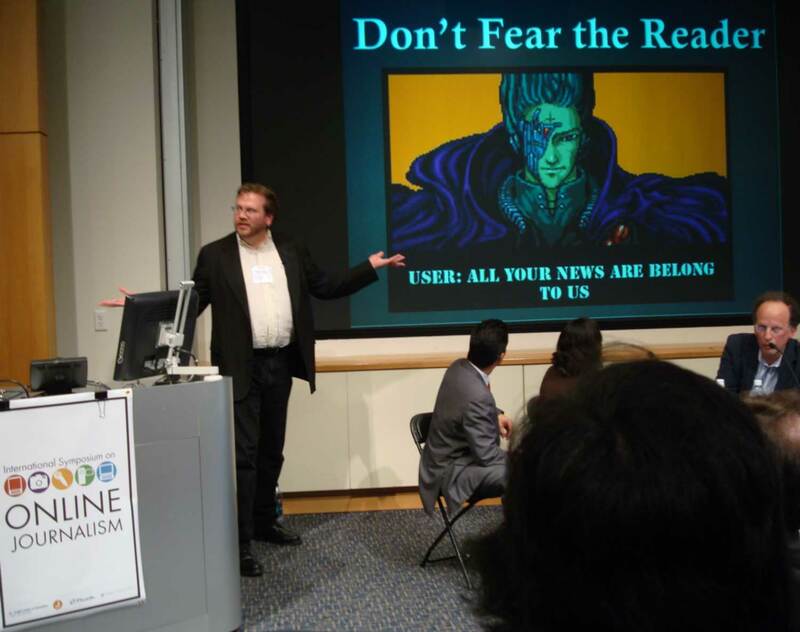 Last week at the International Symposium of Online Journalists in Austin, I presented a series of viral videos to make the point that the national discourse is no longer “owned” by what we think of as professional media. It may seem like a trivial point, when compared to the other nuclear meltdown-level emergencies of declining advertising, lack of a sustainable business model for the future, declining audience share, sky-high debt loads, etc. – but I believe that adapting ourselves to this new environment is the first step towards resolving these other problems. I asked the audience how many of them "got" the central image here, and could put it into its viral meme context. Over at the Online Journalism Review, Robert Niles makes a compelling and far more comprehensive argument about why the whole concept of ownership of the news & the national conversation has been toxic to the mainstream media’s efforts at retaining its audience share. It’s the kind of voice that can re-establish the trust that our audience has lost in us. The one that doesn’t feel the need to kneel and genuflect at the altar of he-said she-said “objectivity.” The one that can make us feel informed, energized, and in control a bit – because things that we can laugh at are no longer quite so scary. 2. Next is a slightly more violent extension of the same concept – this is a commercial for Philips’ new extra-widescreen TV. 3. As an antidote to all the Twitter hysteria (and yeah, I know, by mentioning it I am just feeding into the hype), here’s a video of a guy seated in the smallest, most utilitarian room in the house, reading the Tweets of Connie Reece, the “Mother Nature of the Twittersphere,” one of the most respected social media experts in the world. The tweets are punctuated by actual birds twittering their birdsong. Nice touch. Official Tweet Reading XII: Reading Connie Reece from Marcus Brown on Vimeo. 4. This is a little old, but it made me giggle, and then made me nostalgic. Great display of editing and syncing skills on the part of the creator, BTW. Getting Bert & Ernie’s mouths to match up with the lyrics is a tough task. 5. OK, this one is very, very NSFW. It stands in stark contrast with Scott Berkin’s blog post on Top Ten reasons managers become great. Seth Rogen channels the boss who is trying to convince himself that he’s still in control, but who spirals out of control, goes on a booze-fueled rampage and commits increasingly unspeakable acts upon himself and what appears to be a giant fish.